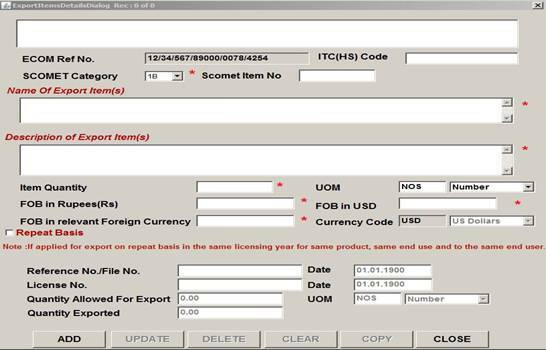 After successful login using ECOM application module through Digital Certificate on DGFT website, exporter will select the SCOMET Application Module. In the File menu option select the Create option,then the following message box will appear. 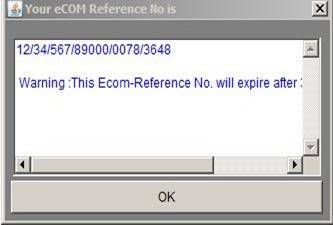 It will show the 20 digit ECOM Reference number. This is the Master screen.The user must enter all the details. 4) Under the shipping details heading, enter the Port of Loading/shipment from the dropdown box. 5) Enter the Port of Discharge. 6) Select from the dropdown list box the “country to which item is to be exported”, the ultimate Destination country and the Purpose of export. 7) Enter the From Date and To-date under the heading “Period during which item is to be exported” in the DD/MM/YYYY format. 8) Select the Jurisdictional Regional Authority from the dropdown list box and by default it is New Delhi (DGFT headquarters). Finally click the save button to save your details. Now you can select from the options given on the right side. 1) Enter ITC (HS) code (if available ). 2) Select the SCOMET category from the dropdown box. 3) Enter the SCOMET Item No., Name and Description of Item(s) to be exported. 4) After that enter the Item Quantity. 6) Enter FOB in Rupees, FOB in USD and FOB in relevant Foreign Currency. If the user has already applied for export on Repeat Basis in the same licensing year for same product, same end use and to the same end user then he has to check in the repeat basis check box and he will enter the File no, File date, License no., License date, Quantity allowed for Export and the Quantity Exported for export and its UOM from the dropdown box. · If the exporter needs to enter another record on the same screen then they first have to click on the CLEAR button and then they can enter another record. After filling all the required entries, it is required to click on the add button again. 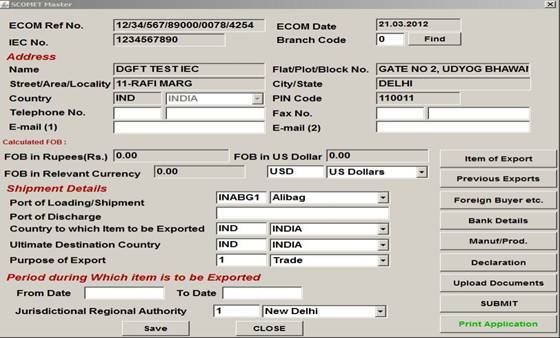 · If the exporter wishes to modify his/her data then they first have to select the required option from the list box and then make changes in the desired field and finally will click on the UPDATE button. 1. The fields that are marked by the Star (*) Symbol are mandatory. 2. Do not copy and paste in the text boxes as some special characters might be added. This is the Second option on the Master Screen. The Exporter will enter desired values and can Add/Update etc. as per his/her requirements. In this the exporter will enter the details of exports of SCOMET Items in the preceding 3 licensing years. 1) Enter the Previous export year from the drop down box. 2) Enter the File No. and Date. 6) Enter the SCOMET Item No. and then Name and Description of export Item. Here Name of Export Item is a mandatory field. When the user clicks on the Foreign Buyer button on the Master Screen a message box will appear informing that details of each one Foreign Buyer, Consignee and End user are to be filled separately. As soon as ok button is clicked the following screen will appear. 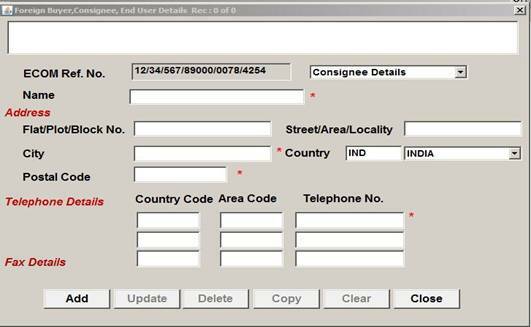 Exporter has to fill details in each one of the following screens that is he has to fill details in foreign Buyer, consignee and end user dialogs. The user can select the user type from the drop down box given on the screen. Exporter can fill in the details of all the three options as per his requirements. 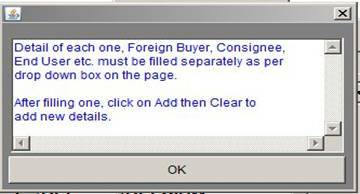 If the exporter selects the Foreign Buyer option, then the following screen will appear. In this he has to first enter the Name. 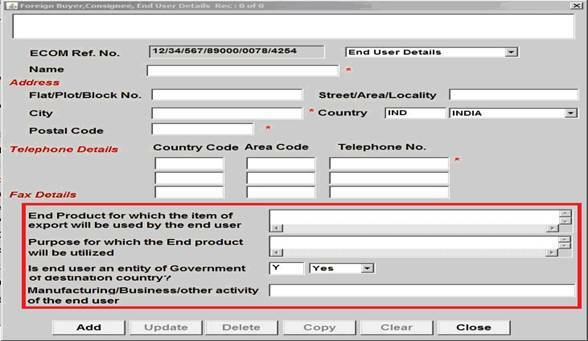 Under the address heading he has to fill the required fields and then can select the Country from the dropdown box. Then again under the Telephone details heading, Telephone No.1 which is marked on asterisk(*) for the first record is mandatory, Telephone No.2 and Fax details are optional. After that fill in the Export order no. and the Date of Export order number. If the Exporter selects the option Consignee Details. 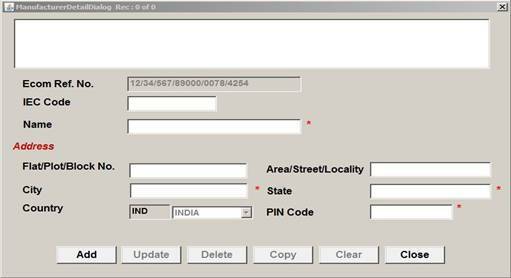 In this he has to enter Name, Full address and the Telephone/Fax details. If the user selects the option End User Detail, the following screen will appear. 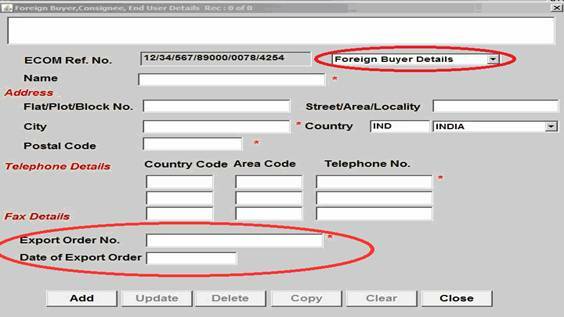 In the above screen all the details appearing in the Foreign Buyer, Consignee details screen are same except the ones that are marked in rectangle as shown in the above screen. Click on the Bank Details button on master screen and fill in all the details. 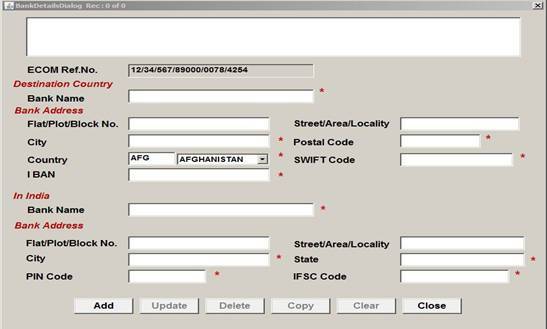 In this screen Exporter under the destination Country Bank address has to fill the I BAN (International Bank Account Number) and the SWIFT Code (Society for Worldwide Interbank Financial Telecommunication), is a unique identification code of the particular bank. Again under the India Bank address heading exporter needs to give the IFSC Code(Indian Financial System Code). All banks have their unique IFSC Codes. 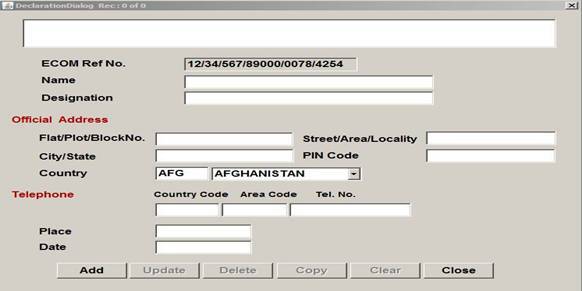 In this option he has to enter the IEC code, Name and his full address. After filling all the details exporter will press the declaration button on the main screen where he will fill his Name, Official Address and the Telephone details. He will select the country from the dropdown box. When the user will click on the Upload Document Button the following pop-up will appear. After reading this he will then click on ok button. After clicking on the ok button on the previous pop-up, a new box will open and the exporter will have to check on items he/she wants to upload. 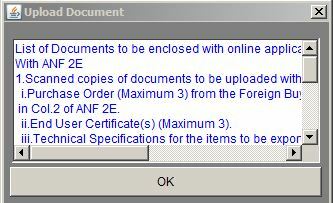 After this Exporter will click on the Upload Document button where he/she can see the uploaded document in the list. Click the Upload Documents Button as on the left side of the above dialog when the Document/File Sign and Upload dialog will appear on a new page. Select the required file that you have to attach and press the Open button. The path of the file will automatically appear as given from your local system in the File text box. Enter the subject name in the subject text box option. When you Click the OK Button the following dialog with the status will appear as follows. In case you want to attach another document click Yes Button and give the path of the file. Likewise repeat the above process for attaching other files.